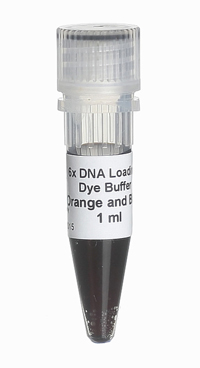 6x DNA Loading Dye Buffer Orange and Blue can be used for loading DNA samples (PCR products, restriction fragments) on agarose or polyacrylamide gel. In 1% agarose gel Orange G comigrates with ~40 bp (1 x TBE) or ~60 bp (1 x TAE) fragments and Xylene Cyanole FF comigrates with ~3500 bp (1 x TBE) or ~5000 bp (1 x TAE) fragments. 07-03-00001 1 ml PDF PDF PDF 3 EUR Login to buy! 07-03-00010 10 ml PDF PDF PDF 30 EUR Login to buy! No interaction with the borate on TBE gels is observed, altering local pH due to the Ficoll component. Store at room temperature or at 4ºC. For longer periods, store at -20ºC. or contact technical support via skype: solis.biodyne.